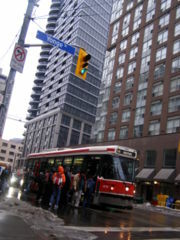 Yonge Street (pronounced "young") is a major arterial street in Toronto, Ontario, Canada, and its northern suburbs. It was formerly listed in the Guinness Book of Records as the longest street in the world, and is a national historic site. Yonge Street was fundamental in the planning and layout of Toronto and Ontario, forming the basis of the concession roads in Ontario. It was also the site of Toronto's first subway line. It also serves as the dividing line between the east and west parts of east–west roads in Toronto and York Region. Yonge Street is home or close to many attractions in Toronto, including street and theatre performances, the Eaton Centre, Dundas Square, the Hockey Hall of Fame and–at the very start of the road–'One Yonge Street', the offices of the Toronto Star. The Yonge Line of the Toronto Subway runs under and in open cuts beside Yonge Street from south of King Street to Finch Avenue. The Viva Blue BRT line continues along Yonge from Finch to Newmarket Terminal.